It’s almost summer, and that means plenty of new fitness goals. Everyone has the best intentions, but how do we act on those good intentions and actually commit to a plan? We figured asking a former Mr. Universe wasn’t a bad place to start. Naked team member Thomas Ward had the opportunity to sit down with Bryan and Brandie McCluskey, the dynamic duo behind Fit Pros Gym in Denver. Bryan is a certified Master Trainer with over 30 years of experience in strength and conditioning, powerlifting, and bodybuilding. In the late 1980s, Bryan McCluskey won both Mr. Universe and Mr. America in his weight class. His wife Brandie is a certified Elite Trainer, long-time yogi, and model/bikini competitor who has been featured in Muscle and Fitness Magazine. 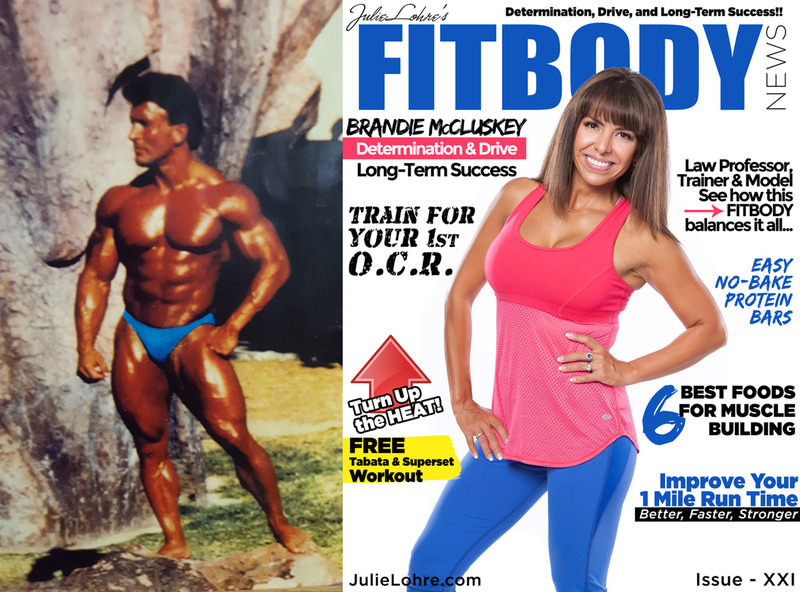 See Bryan posing in peak form on the left and Brandie's feature on the cover of FITBODY Magazine on the right. Thomas sat down with Bryan and Brandie to ask them to share their knowledge with the Naked community. While we admit that we were looking for some groundbreaking tips and tricks, it ends up that Mr. Universe doesn’t have any special tricks – he trains just like you. Thomas: So Bryan and Brandie, how did you first get into fitness? Bryan: Around 1980, I was a trucker in very bad health. I was smoking up to 5 packs of cigarettes a day. I knew I had to make a change, so I got an education and started lifting weights. I gained 40 lbs of muscle the first year. Brandie: I first started with yoga, but it wasn’t changing my body the way I wanted. Eventually I moved into more weight training. Thomas: Bryan, as someone who has competed at the highest level of competition (Mr. Universe, Mr. America, etc.) what advice do you give to someone who is looking to get started on a new fitness regimen? Bryan: There are four main components to fitness: cardio, nutrition, stretching, and weight lifting. Starting slow is crucial. Begin with nutrition. Then add in weights. Then focus on nutrition, weights, AND cardio. Finally, add in stretching. You will never stay committed if you try to change all these things at once. Once you quit it’s hard to start over again; stay consistent, and don’t give up! To physically see results you need to get into the gym a minimum of 3x a week and a maximum of 5x a week. 1-2x a week may be enough to maintain, but you really won’t see much progress. Very important: Confuse the body! Your body has a tendency to get used to routines, and you’ll stop seeing progress. Mix up your workouts in terms of weights, reps, cadence, types of cardio. When you’re doing HIIT, do 20 minutes sometimes and 35 minutes other times. It’s the same with diet; don’t stick to the same thing all the time. Your body will get complacent, and it won’t thank you. Don’t waste your time! 30 Minutes is all you need. Then your body has 23 ½ hours to recover. The faster you tear it down, the faster you can recover. The liver only has 30 minutes of glycogen storage; unless you are sucking on some sort of fuel, you’re done! If you get to the gym for 30 minutes a day, 3x a week, you will see gains! And losses for that matter. Brandie can do 40 minutes of cardio and burn 400 calories or do 20 minutes of HIIT and burn the exact same amount. And her results were far better from doing HIIT than pure cardio. Above all, stay away from processed foods, and get rid of the sugar. We’re not talking salad everyday; make sure you are eating a lot of protein. As with exercise, remember to confuse your body! Don’t stick to the same thing; you should make a change in your diet every 4-5 weeks. You should never stretch before you exercise; instead warm-up with things like jumping jacks, anything to get the blood flowing. Stretching creates micro tears before your routine, and this can make you more susceptible to injury. Think of your muscles like a rubber band. When its room temperature it will do what you want, when it gets warmer it will stretch further, and if you put it in the freezer it will only go half as long. The reason why we take supplements is because our foods are so stripped and processed that they don't have the same vitamins and minerals that they used to. My whole career I had many offers to endorse vitamin companies. In the 1970s the sewers of New York were flooded with multivitamins that weren’t broken down. They still had the enteric coating around them. The body couldn’t digest them! Sometimes I regret not doing it because I would have made a LOT of money, but in the end, I took Flinstones chewables 3-4 times a day for my whole career – It’s good enough for kids so it’s good enough for me. That’s all I took – They taste good, they’re chewable, and I look forward to having a few of them. Be safe. If your body tells you that you need to puke or that something isn't right, listen to it and back off. Our body is the greatest messenger we have, LISTEN TO IT! Don’t push it if you just had a baby, are post surgery, or have an injury. If you were involved in activities when you were a little kid, that's the best type of client I can have. Making those changes to have a healthy lifestyle is easy. Your body remembers that little athlete inside. It may be covered up with some layers, but your body remembers. It's just about bringing it out! If you want to get in touch with Brandie or Bryan, you can reach them here.